Skyhook Wireless, a maker of WiFi-based location-positioning technologies, will have to be patient in its patent assertions against Google, unless it finally realizes that it has to sue in such jurisdictions as Germany, not the United States, if it wants to make headway and build settlement pressure in the foreseeable future. Skyhook, which started suing Google in 2010, now faces considerable risk of not getting its day in U.S. court (i.e., a patent trial) before 2014 or 2015, even though a trial in Massachusetts over two patents had been scheduled for August 2013. 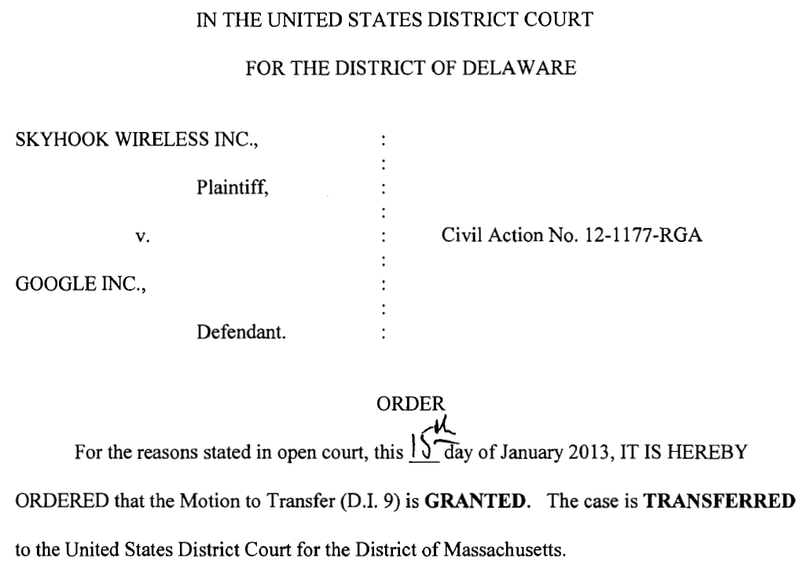 On Tuesday afternoon by local time, Judge Robert G. Andrews of the United States District Court for the District of Delaware granted a Google motion to transfer an infringement action Skyhook brought in his district in September 2012 over nine patents to the District of Massachusetts, where Skyhook brought its first patent lawsuit against Google (over originally four patents, two of which have been dismissed) 28 months ago. In Massachusetts, Skyhook had also brought a state lawsuit over competition issues, which exposed some of Google's Android-related practices (but that's the only thing that competition lawsuit has achieved). The direct effects of the transfer aren't the worst part: both Delaware and Massachusetts are relatively slow districts for patent infringement cases, and Skyhook is based in Massachusetts, which could be helpful with a view to a jury trial. But in October Google told the court that after a successful transfer of the 2012 case to Massachusetts it would bring a motion in to consolidate this one with the 2010 case. 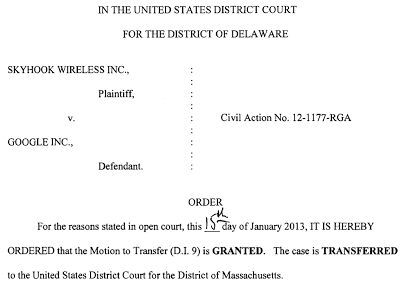 Should the motion to consolidate succeed, Skyhook won't get an August 2013 trial. There would be a need to develop an evidentiary record over nine more patents, and for various pre-trial pleadings and decisions, all of which would delay resolution at least into 2014 or, more likely, 2015. The whole idea of such a transfer to a district in which an earlier case was filed is to leverage certain synergies. There are some efficiency gains if you simply have the same judge oversee a case between two parties involving the same field of technology. There can also be a recycling of evidentiary records. Those efficiency gains wouldn't require wholesale consolidation of the two cases, but courts are generally very interested in reducing the burden on juries, holding one trial rather than two. Having followed the argument over the possible transfer (and many such arguments in other cases), I'm not surprised that Google's motion succeeded. It appeared to me that Skyhook's arguments against a transfer (rather limited overlap, but some overlap, of the issues) were just about good enough that a court with a strong desire to keep the case in its district would have been able to deny Google's motion, but fell far short of what was needed to be likely to fend off Google's world-class gamesmanship. I have yet to see a plaintiff doing well in Delaware within a reasonable time frame. It was a nightmare of a district for Apple against HTC. Nokia, which is also much bigger and far more sophisticated in the patent game than Skyhook brought some cases there against HTC and ViewSonic, and instead of setting a reasonably fast schedule, the court there just sends the parties to mediation without actual guidance on the legal strength of the cases. I have checked the online register of the European Patent Office, and Skyhook has filed about two dozen European patent applications, some of which have been granted. If I were in Skyhook's situation, I would bring infringement cases in Germany at the earliest opportunity, ideally through a law firm that already has won decisions against Google's Motorola or is presently suing it here. The cases here could be brought against Google and/or Motorola. Litigation in Germany isn't as cheap as some people think, but on a per-patent basis it's much less expensive than in the United States, and infringement rulings in a court like Mannheim come down within less than a year of filing a complaint. If Skyhook's resource constraints don't permit multijurisdictional litigation, I think Skyhook should consider withdrawing at least parts of its nine-patent lawsuit, which would probably make sense anyway given that after the consolidation Google hopes to win (and may very well win) there would be 11 patents in play in the District of Massachusetts, resulting in tremendous pressure on Skyhook to narrow the case before a trial.